Age-Related Macular Degeneration (AMD) is the breakdown of the eye’s macula, the area of the retina (the light-sensitive tissue lining the back of the eye) responsible for clear pinpoint or central vision. It typically affects individuals over the age of 60 and is heralded by blurry, dark or distorted central vision. Dry AMD is the more common type of the two, representing approximately 90 percent of all AMD cases. Dry AMD begins with the accumulation of drusen (yellowish “aging spots”) and pigmentary changes in the macula, which in later stages may lead to atrophy resulting in slowly progressive loss of central vision. Wet AMD affects about 10 percent of all AMD patients. It results from growth of blood vessels underneath the macula, which leak blood and fluid, thereby causing, in many cases sudden, distortion and severe loss of central vision. 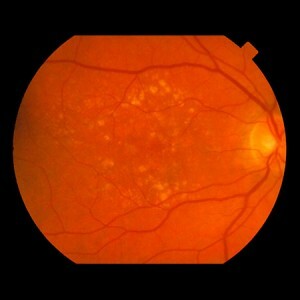 If untreated, Wet AMD may progress to macular scar, leading to permanent loss of central vision. While there is no cure for AMD, the doctors at Retina Macula Specialists of Miami offer advanced treatments that stabilize the progression of the disease and, in some cases, improve vision. Regular eye examinations to facilitate early detection of AMD are essential, since most therapies work best when started at an early stage of either type of the disorder. Treatment of Dry AMD is generally aimed at preventing progression of the condition through nutritional intervention and frequent retinal examinations. Patients who have intermediate or advanced Dry AMD are advised to take a special formulation of vitamins known as the AREDS2 formula, which includes zinc, copper, lutein, zeaxanthin, and vitamins C and E. This formula has been shown to decrease the rate of progression of AMD toward more advanced stages. Dietary modifications are also recommended and include increasing intake of dark green leafy vegetables (e.g. spinach, kale, collard greens) and fish (e.g. wild salmon) as well as limiting intake of saturated fats. Patients are also advised to quit smoking. Wet AMD treatments, including laser beams and injectable drugs, focus on inhibiting the growth of the abnormally developed blood vessels in order to prevent them from leaking and spreading. AMD treatments may also be combined for optimal results and, in many cases, can effectively halt the progression of AMD and improve vision. Re-treatment is often necessary for years. An innovative device, known as an implantable miniature telescope (IMT) has been designed to be implanted in place of the patient's natural lens. While not a cure for AMD, it offers hope for improved vision for those with advanced AMD. Can Age-Related Macular Degeneration Cause Blindness? While macular degeneration can lead to significant central vision loss, the condition does not cause complete blindness. Individuals who suffer from severe AMD are still able to use their peripheral vision and, with the assistance of low-vision devices, can learn how to function effectively. The key to preventing advanced AMD and severe loss of central vision is early detection. Please contact Retina Macula Specialists of Miami to schedule your retinal examination.